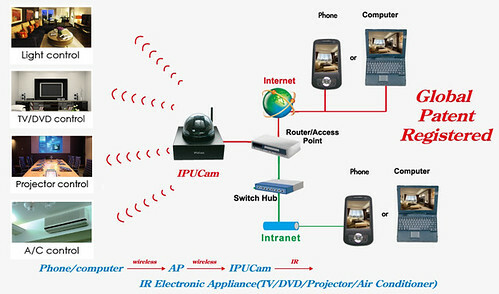 Interesting solution for home automation I received recently to my email – IPUCam. Basically it’s a mix of IP camera and controller. It might be connected to the home LAN via WiFi or Ethernet and can control various devices via IR. To control system consumers may use any PC with web browser or iOS devices. Additionally to control your home the IPUCam allows to view video and audio stream from built-in camera as well as detect presence by its motion detector. The IPUCam Smart Scene Controller is tagged at $279.